While I realize that the 4th of July is a day to celebrate our country’s independence by grilling out, spending time with family and watching fireworks, sometimes you need a quick and quiet activity for your kids in between all the fun. 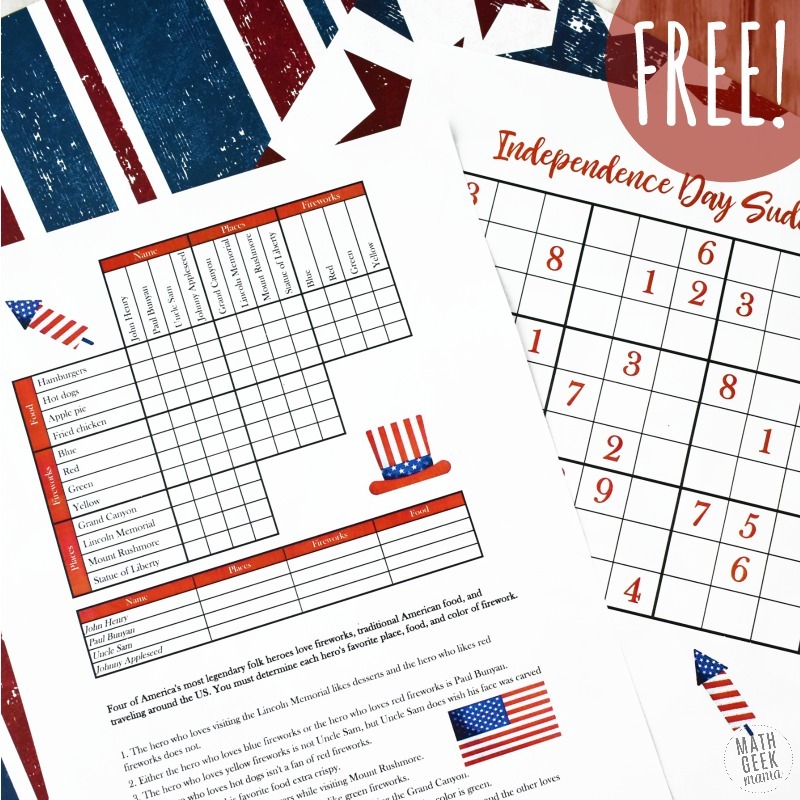 This cute set of 4th of July Logic Puzzles for kids is a chance to challenge each other, and maybe keep your kids out of the kitchen for a few minutes while you finish last minute preparations! Or maybe you just need a fun, family friendly activity for after dinner while you’re waiting for fireworks. Either way, enjoy this fun set of puzzles! 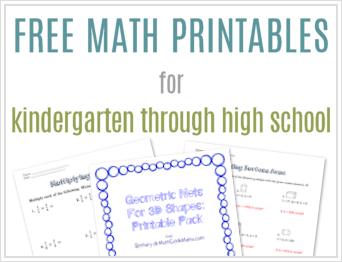 This free download includes 3 different logic puzzles, plus answer keys, making it super easy to print and play. I would recommend these puzzles for kids (and adults) ages 9 and up. 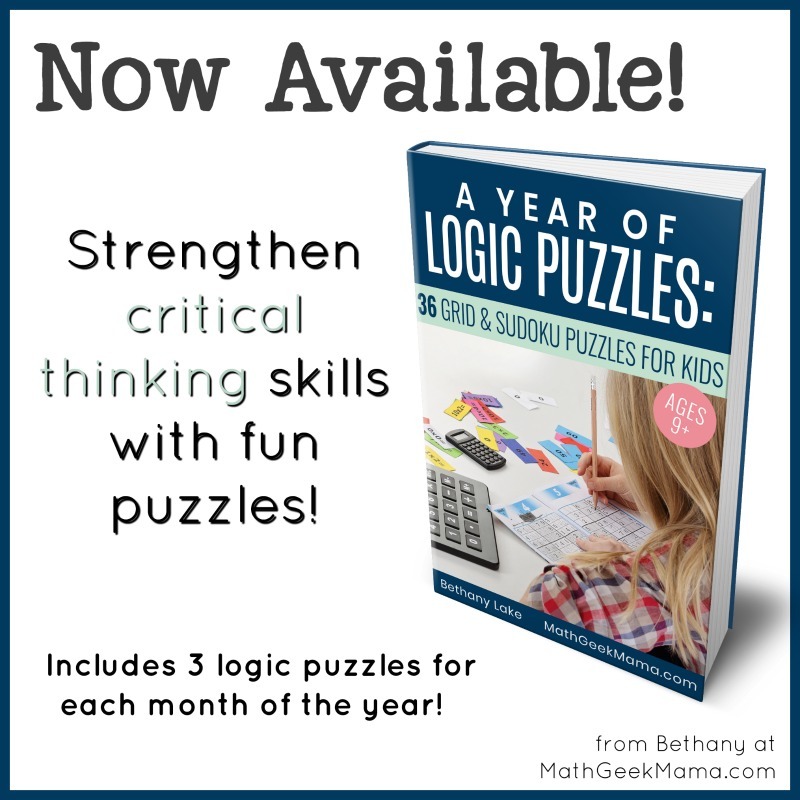 If grid style logic puzzles are new for your family, you might pair up and work together to try and solve them. Perhaps adults or older teens can pair up with a younger child and then everyone can see who completes it first. But if you’re looking for puzzles for younger ones, you might like this set which uses pattern blocks. 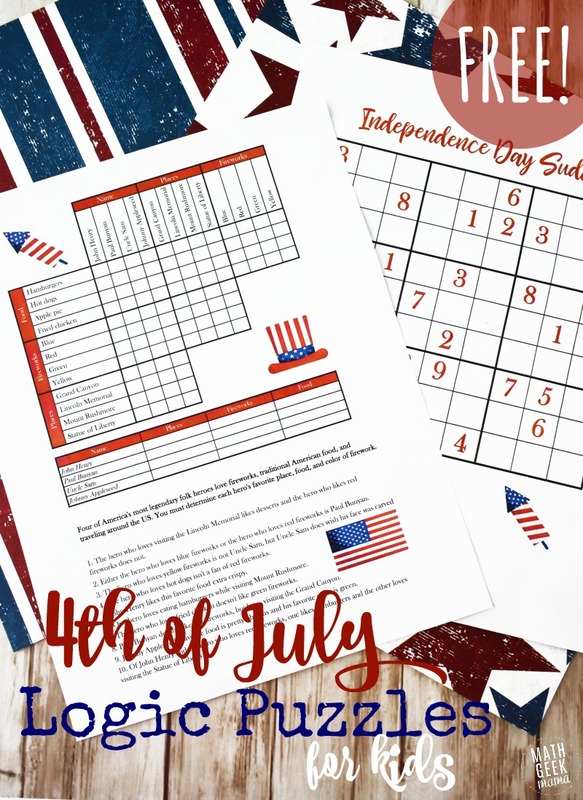 And while this can be used as a fun brain teaser this 4th of July, it is also strengthening those math and logic skills! Learn more about why logical reasoning is so important in this post. The first puzzle in this download is a grid puzzle. 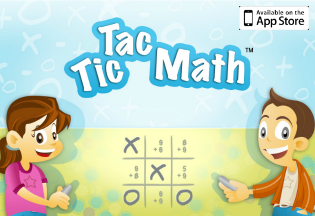 This means a set of clues are given and you use the grid to check or cross off combinations that don’t match. 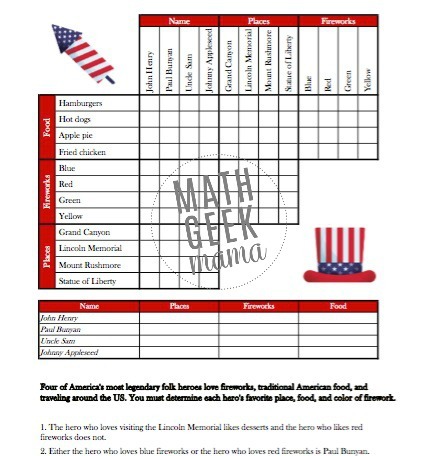 For example, in this puzzle, the task is to determine the different combinations of folk heros with their favorite food, U.S. landmark and color of fireworks. Even if you don’t complete this on the 4th of July, it would make a fun addition to a history unit, or geography study of U.S. landmarks. 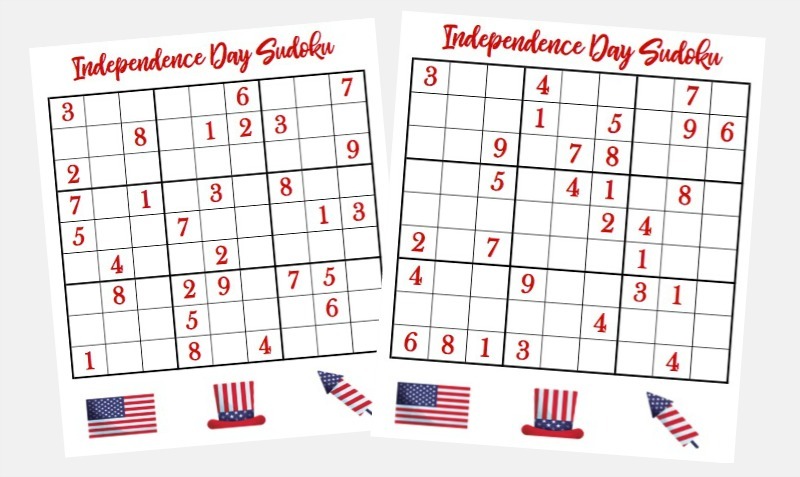 Lastly, there are two sudoku style puzzles included in the download. This type of math logic puzzle will likely be more familiar to you or your kids. To complete each puzzle, you fill in all the boxes with the numbers 1-9. 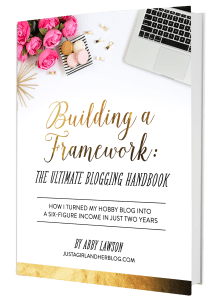 The trick is that each row, column and 3×3 box can only include each number one time. You cannot repeat one of the numbers. This is again a great way to increase logical reasoning skills as you have to think about what possible options there are for each box. Kids who have a strategy will be excited to share, and kids who don’t will benefit from hearing how others see and approach the puzzle. However and whenever you complete these puzzles, I hope it is a fun challenge and opportunity for your kids to learn! And if you have fun with these together as a family on the 4th of July, share a picture with me on social media! I’d love to see it!